frankly my dear...: Comfort food. You probably all know by now how much i dislike winter & i'm sorry but i will be whingeing about the cold weather until summer. I am a summer girl. The one thing i do not mind about this dull time of the year is the excuse to indulge in some delicious comfort food. It warms the soul & i love my food! So around here we've been enjoying some yummy, yummy comforting stuff lately. Lots of soups, roast chicken, homemade pasta, banana bread, creamed rice in the slow cooker, breads & a divine lemon meringue pie. 100g digestive biscuits - crushed. Method: Mix butter & biscuit crumbs together & press into the base of a small pie tin. Chill in fridge for 30 mins. Method: Whisk the egg yolks with the sugar & cornflour until they are pale & smooth. Put lemon juice & zest in a saucepan with 200ml water & bring to the boil. Pour it over the egg mixture, beating constantly until the mixture has dissolved in the water. Pour the lemon mixture into the pan & return to a gentle heat. Cook until thickened, stirring constantly. It's ready when the spoon leaves a visible 'wake' as you stir. Fold in the butter & pour mixture on the crumb base. Method: Beat the egg whites until they just start to set & add caster sugar, one third at a time, until mixture forms stiff peaks. Spread over lemon mixture & bake pie for about 20 - 30 mins. 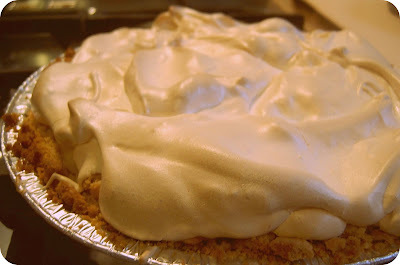 The meringue should be slightly browned on top. Serve cooled. Nothing like good old fashioned home cooked food to warm the soul & fill the belly!